With Mardi Gras right around the corner Deanie’s Seafood Restaurants and Seafood Market are getting excited about serving up “Authentic Louisiana Wild” crawfish yet again this year! We only serve the best, and that’s crawfish harvested or caught in Louisiana, and certified through the Louisiana Wild Seafood Certification Program. We prepare Louisiana’s favorite and most unique crustacean in Deanie’s signature Cajun crawfish boil seasoning with just the right amount of spice and serve the hot mudbugs up with spicy potatoes and corn. 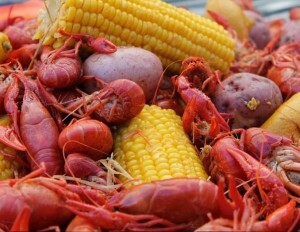 And once the season is in gear, Deanie’s online retail website shopdeanies.com will ship boiled and live crawfish, as well as the necessary accompaniments such as seasoned boiled corn, sausage and potatoes, throughout the season for those out of towners and displaced Louisianians with a craving for crawdads! Louisiana crawfish generally begin to make an appearance in January and February and are at their peak season in March, April and May. However, seasonality can vary based on weather conditions and other natural forces. We like what we are hearing about the 2015 season so far: Crawfish farmers say that due to this winter’s mild temperatures, this season is looking promising (wwltv.com), which means more and bigger crawfish and lower prices. Kyle LeBlanc, a Raceland farmer, explains cold weather, as we experienced last year, sends crawfish into a lethargic state and they won't feed as much, with many burying themselves in the mud. “Warmer temperatures mean crawfish are active and can then be caught more easily,” LeBlanc said (wwltv.com). Harvests are predicted to begin in mid-January and to pick up throughout February just in time for Mardi Gras, which falls on Feb. 17 (wwltv.com). Deanie's Seafood restaurants are now serving Boiled crawfish, based on availability, and will feature them more consistently as the season progresses. To share in the Louisiana tradition of a Crawfish Boil at home, you can make your way to Deanie’s Seafood Market in Bucktown and shopdeanies.com, where you can order live or boiled Louisiana Crawfish, as well as other fresh Louisiana seafood, including live and boiled Blue crab, fresh or boiled shrimp, shucked and whole Louisiana oysters, Deanie’s prepared items and more. Shopdeanies ships orders for overnight delivery throughout the continental United States, Canada, Puerto Rico and the US Virgin Islands. We hope you have a spicy Louisiana crawfish season, and look forward to seeing you at one of our Deanie’s locations or at our seafood market!